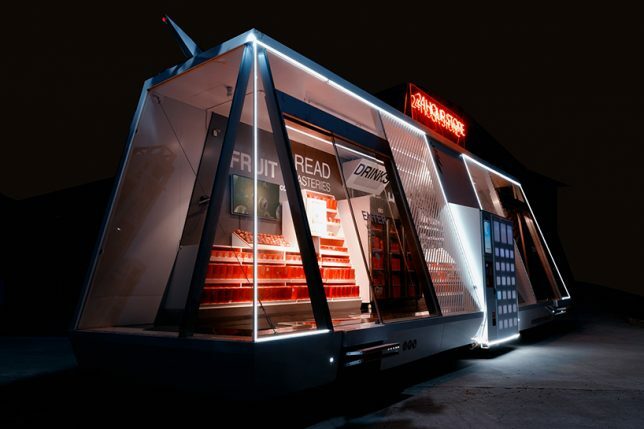 It’s a tale as old as time, or at least: science fiction films — an autonomous grocery store on wheels (staffed by a holographic assistant) that can deliver late-night snacks as well as everyday essentials. The Wheelys “Moby Mart” looks the part as well, sporting a trapezoidal shape, illuminated display in front, vintage neon sign on top, and mysteriously uniform boxes on the shelves inside. 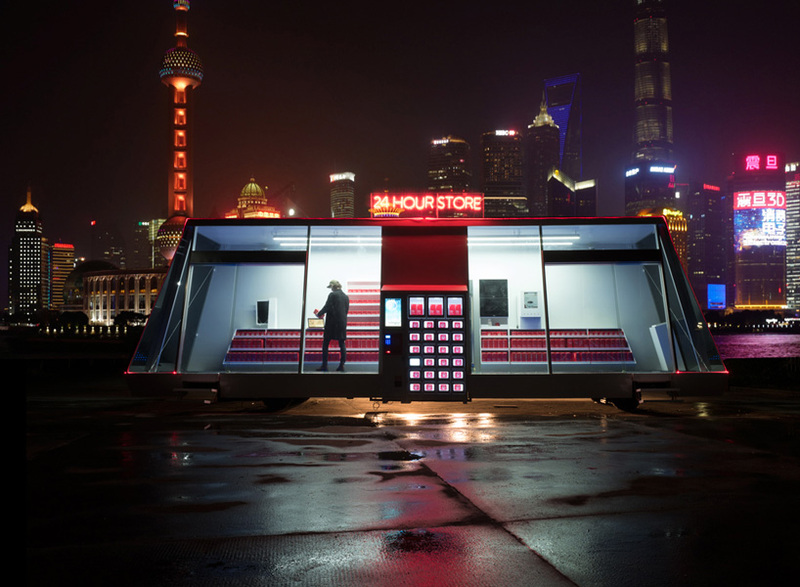 But that retrofuturistic look is just part of the package: fueled by solar panels on the roof, this driverless shopping center operates staff-free 24/7. When it runs low on stock it returns itself to a warehouse automatically for reloading — eventually, its makers hope to task a fleet of rooftop drones to do those pickups (maybe they could be extended to make deliveries, too). 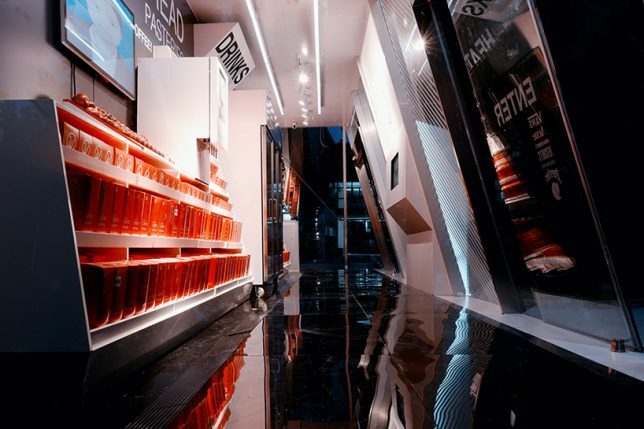 Like other new grocery store prototypes, there will be no need to check out — items taken are automatically tallied and added to a shopper’s bill. If you need any help, the aptly named Hol (a holographic store assistant) is on hand to assist. To top it all off, the Moby Mart has the potential to be carbon-negative, at least in terms of its urban travels — soaking up the sun for fuel, it also captures and cleans smog on its grocery runs. 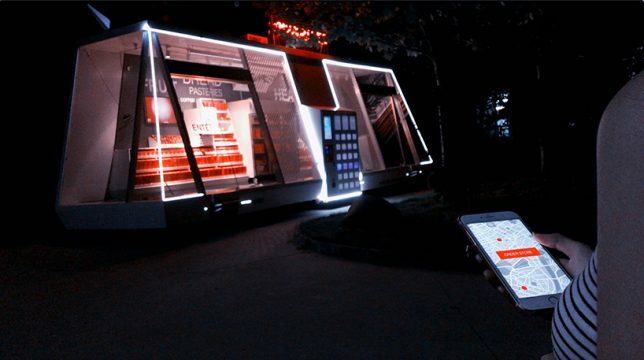 A project of Himalayafy, Hefei University and Wheelys the first prototype is currently being tested out in Shanghai, a sweet spot for cyberpunk fans but a bit far for some of us to travel. But don’t worry: if all goes well your city may get one soon, too.